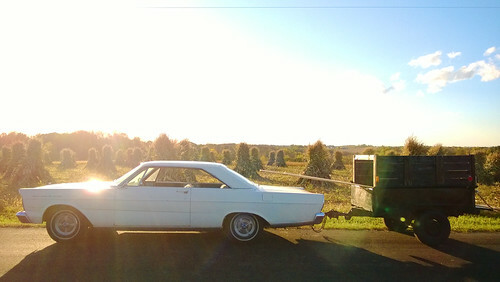 oh nothing, just hauling lumber with a 1965 galaxie 500 and a 1938 dodge truck bed trailer. 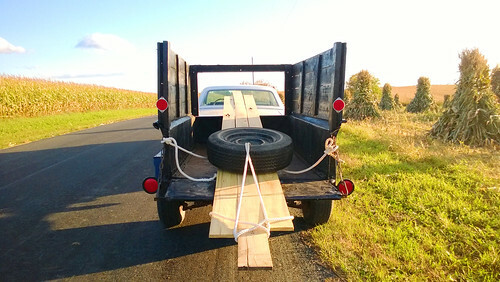 the way i figure it, if you’re going to go get some 14 and 16 footers for the treehouse from your amish sawyer and you have the opportunity to use a trailer made from a 1938 dodge truck from marv who lives down the street who got it from his father, well, it’s a no-brainer – it’s The Way It Must Be Done. you can 8 footers just fine without a trailer with the old ford but 14 and 16 footers are looooong. i thought i’d be able to keep the trailer gate closed but they boughed enough that they were resting on the roof of the galaxie which wasn’t going to work, so i had to improvise with what i had available. having frida tag along makes the adventures all the more fun! she didn’t go out to the sawyer but she was veeeeeeery happy to hop in and help me return the trailer to marv. Previous Posthappy bartolome day!Next Postfrida surveys the splendor of the cosmos organicos garden plot. 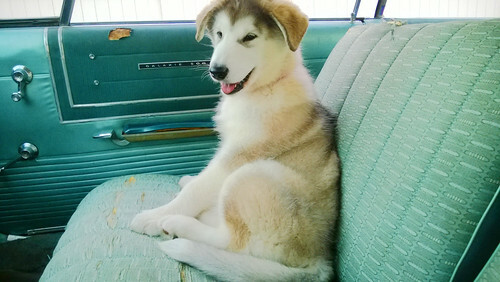 My first car was a 1966 Galaxy 500 with the same color interior. I love everything you have going on here.